The Wiki of Unify contains information on clients and devices, communications systems and unified communications. - Unify GmbH & Co. KG is a Trademark Licensee of Siemens AG. The connection of communication systems to the public network via SIP Trunking can be used instead of or in addition to traditional PSTN trunks. Many VoIP Providers, also known as ITSPs, are offering corresponding services. The following article gives an overview of the SIP trunking features and limitations and lists the Providers, which have been tested and released with the SME platform OpenScape Business. You did not find your provider? Find out how to get it released! 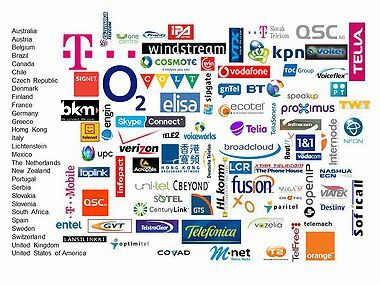 OpenScape Business has been tested with a large number of Internet telephony providers that support SIP. Continuously new providers are tested, released and included within administration. As the SIP recommendations leave some room for interpretation, there are differences in the range of features supported with a specific provider. In this chapter general information is given which is valid for all SIP Providers. Comprehensive feature set available e.g. Simultaneous VoIP connections depending on available DSL bandwidth, used Codec and system. Security Warning - Malicious attacks from the Internet may lead to reduced service quality or toll fraud! Never open up the firewall in an internal or external router e.g. by forwarding port 5060. The SME platforms take care of opening the firewall for traffic with the selected VoIP providers. Attacks from other internet addresses are therefore blocked. Opening up the router's firewall would invalidate this security measure. Never configure SIP subscribers at an OpenScape system without a strong password. For diagnostics and SIP provider configuration hints see How to enable blocked SIP Providers. Intermediate routers shall support quality of service and bandwidth control mechanisms if the WAN link is used for voice and data simultaneously. SIP messages have to be routed transparently. For interworking with different network configurations and edge devices and how to use STUN please see Network Configuration for VoIP Providers. Concurrent calls via ITSP (depending on the available bandwidth and used Codec). outband transport via RFC 2833/RFC4733 is highly recommended. The ITSP MUST support outband DTMF (RFC2833/RFC4733) if UC Suite functions via SIP trunk (e.g. auto attendant, voicemail control) shall be used. inband transport may be used, but the functionality cannot be guaranteed as endpoints (e.g. UC-Suite) may not support inband DTMF. FAX over IP with T.38 is recommended for analog Fax devices, terminal adapters and the OpenScape Business UC Suite. If your provider does not support Fax T.38, Fax pass-through with G.711 is possible but transmission quality depends on network infrastructure in this case. Since OpenScape Business V2 UC Suite is able to handle T.38 to G.711 fax fallback as well. An incoming ITSP call can be transferred to another public subscriber via ITSP. 2 lines (one incoming and one outgoing) are used while the call is active. A trunk prefix to select a SIP trunk as an alternate trunk can be used from the OpenScape Business client's dial box but not from client's directories and settings (myPortal, myAttendant, myAgent). Because of the above limitation SIP trunks cannot be used for presence based call forwarding if a TDM trunk is present in parallel . analog fax/modem connections are not supported by all SIP providers. Emergency call numbers (e.g. 110, 112) are not supported by all providers. Tests are necessary with every new provider before making installations in the field due to different implementations of the SIP protocol. Otherwise no support is available for an ITSP. Test resources have to be provided by the region or partner. Select the VOIP / SIP trunking providers, which are most important for your business, estimate business relevance and get agreement for start of certification from product management. In the .zip-file you find a process description, the testlist and a template for writing a configuration guide. The main SIP trunking functions of the SME platforms have been tested with the following Internet telephony providers. For detailed information see the document Overview about Released SIP Providers below. Please check provider home page for supported countries. The table above shows the ITSPs that passed successfully a connectivity test. More details about test results, supported features and restrictions for a specific ITSP are listed in following PDF document. The connectivity tests are performed using various endpoints (for details see test list). All other company, brand, product and service names are trademarks or registered trademarks of their respective holders. Content is available under CC-BY-NC-ND 4.0.